If you want to tone the muscles of the chest, this simple routine can be very useful. If you are a person who trains often, you will know that it is advisable to exercise all the muscles of the body, from top to bottom. For those who want to get stay fit and do not know where to start, You will be happy to know that, you can get in good shape without going to the gym. And you can do all the exercises at home without any type of equipment. There are different exercises and types of training that help us improve our physical shape, without having to leave home. One of the most important muscles that we must exercise are the pectorals that, in addition, having them in shape help us to have a raised and beautiful chest. we all heard the name of push-ups. The push-ups is one of the most famous and effective exercises that serve us as much for the pectorals as for the abdominals or the muscles and back. We place ourselves face down on the mat, with the arms in front and the body straight. Take a breath and as you exhale, bend the elbows to the sides, lowering your chest to the ground. Return to the primary position of inhaling. You can do the exercise 10-12 times and if you feel it is too heavy you can help your knees. To do this, it accommodates the same position mentioned above but with the knees touching the ground. Surely this way it will cost you less work and you will continue exercising the zone that we want. The first of the exercises for the chest at home that we propose is bending with a slap. it is a fantastic exercise to tone the upper body and work the power. To carry out a bending with a slap you need to pure strength and speed, something that will be of great help to exercise the upper body: chest, shoulders, arms and the core. Before you doing push-ups with a slap, it is necessary to do a good warm-up, especially of the upper body. If you are ready, place yourself perfectly on the floor on hands and feet, with your hands a little more open than the straight line of the shoulders and straight legs, touching the floor with only the tip of your feet. You must be line up your back with the backbone straight from buttocks to head. Once you have a good posture bend your elbows and you see lowering your body towards the ground and keeping your elbows at a 45º angle with respect to your chest. And when you touch the ground with your chest, quickly stretch your arms with the strength to adjust yourself and You can give an applause in the air with enough time to turn your hands to the ground, to repeat the operation. Believe it or not, the inclined push-ups is the best workout for chest. One of the difficulties of practicing exercise at home instead of in the gym is that we can not regulate the weight. However, the inclined push-ups are one of those that lend themselves more to increase the weight and difficulty. Besides, it is one of The best exercises for the chest at home since you only need a table or a point of support. First of all, to perform inclined push-ups you need to find a flat floor, where you must put your hands with enough resistance and safety so that you can hold your weight without any problem. You can do them with large yoga balls, although a table or a chair can fulfil this exercise perfectly. Once you have to do it, set your hands on the floor in the same way as you did for the previous workout. But you must bear in mind that the more open your hands are the more you work the chest to the detriment of arms. It is important not to drop the hip, for this you keep abdominals and buttocks in tension, something that will also offer you more benefits with a simple exercise done from home. 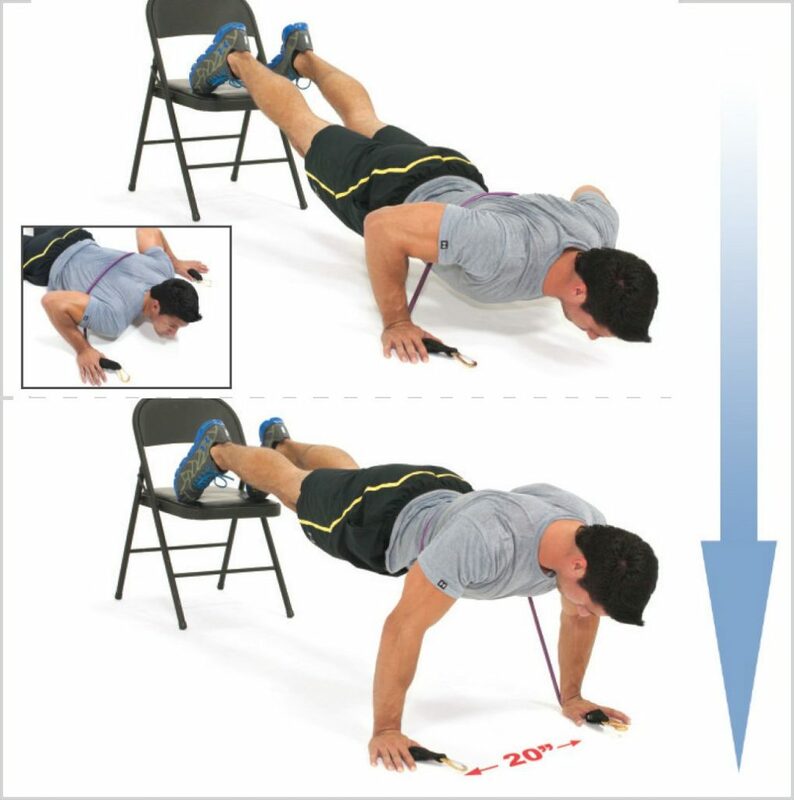 The declined pushups are one of the best chest exercises to practice at home easily. Its offering great features in a simple and comfortable way. As it happened with the inclined ones you will also need a floor to support you. It is very important to have a good posture, that is why we recommend to stressing both the abdominals and the lower back so that the back does not suffer. In order to carry out an inclined flexion, you should place yourself as if you were going to do a normal flexion. But in this case, the feet will not rest on the ground but on a raised surface such as a bench, a chair or some stairs. The exercise tries to lower the body until the chest touches the ground and then rise again with the strength of the chest. To be able to tone your chest without going to the gym you can also use a fitness instrument that you can easily have at home: the dumbbells. With them, you can do a different of exercises, such as the one we propose below. You will have to lie down with your back on a mat or floor, bend your knees trying to form a 90-degree angle and take a dumbbell with each hand. The exercise consists of having the arms stretched at shoulder height and climbing the cuffs upwards, above the chest. You have to raise the dumbbells up and down, in the same way. Repeat this exercise 15 times and do 4 sets. We have already explained what are the best chest exercises for at home. Now we want to give you a series of instruction. If you want to get the best results in a short time, you can do some great pectorals. To work properly the chest we recommend that you work this routine a minimum of 3-4 times week. You must do 3- 4 sets of between 10- 15 repetitions of each exercise, depending on the level you are in and the time you have spent doing it. If you see that you already do it easily, the requirement increases: do more repetitions, increase the weight with a backpack, do more series. Not only do you need to tone up, but you must also add cardiovascular activities to your routine, such as cycling or running, that help you burn fat so your pectorals can come out with a good shape. Well, my friends, I am very sure this article was of great help you and I know you found that answer to your question. If you still have any doubt about chest exercises for at home don’t forget to comment.